Among those deficiencies were a lack of accessibility, poor wayfinding, inadequate security, and a lack of sustainable design features. The building was also severely overcrowded, with judges forced to share offices, holding cells in which security and separation were compromised, and inadequate waiting rooms and conference space to provide for the needs of court business. The court had outgrown the facility and was forced to locate a separate site for juvenile and housing court a few blocks away. Finally, the grand entrance on Main Street wasn’t even an entrance anymore; visitors entered from the back. The historical courthouse facade and entry and the new entrance in the addition. While the state had studied the possibility of tearing down the venerable old hall of justice and replacing it with an entirely modern facility, that approach was ultimately rejected in favor of a hybrid scheme that retained the original building while moving most court functions into a new addition behind it. “We wanted to respect the existing architecture without overpowering it,” Minnis explains. One of six courtrooms in the new addition. For the new Franklin County Justice Center, as it is now known, the Leers Weinzapfel design restores the front of the original building, which is used for administration space by the clerk and probation departments, while the much larger addition features a new entry, as well as six courtrooms, a law library, detainee circulation and a jury-pool room. Perhaps most crucially, there are separated circulation paths for prisoners, judges and the public, who now come together for the first time in court. At the same time, the modern addition takes advantage of the sloping site, in order to stay within the height of the original. 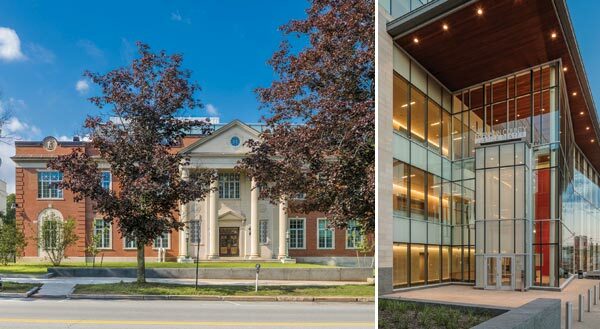 “The much larger addition sits back from the original building, with a light and glassy top that allows the strength of the classical facade to retain its mark on Main Street,” Minnis says. The light-filled jury pool room speaks to the transparency of justice. 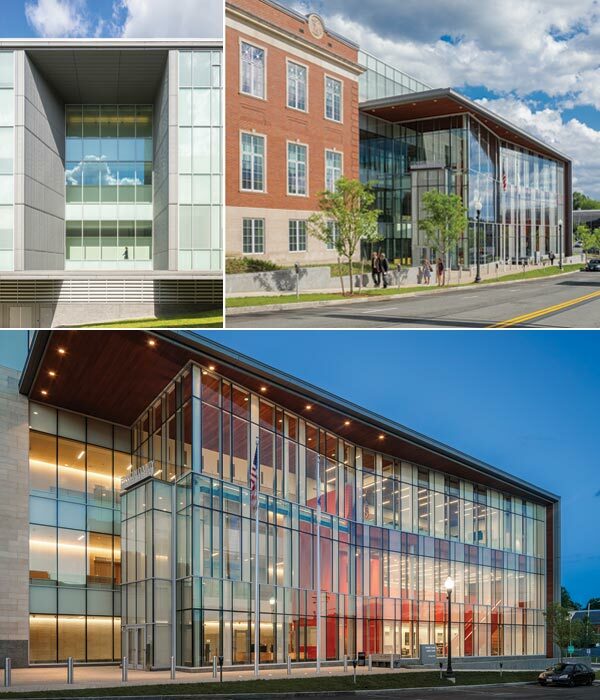 To maintain the integrity of the 1931 courthouse, with its elegant brick and limestone facade and historic style, the new addition provides a contrast with its glass facade, proffering a bevy of natural light for the lobby and circulation areas, which then gives way to a three-story limestone inner wall that matches the masonry of the existing structure. “That glass piece is the public zone,” Stevenson explains. “It has connections to every space. There is a library where the public can go and research issues, and then there’s the jury-pool room where you come to become a juror. All the public spaces are right there.” Beyond the public zone are the solid courtroom zone, and then a private circulation for judges. 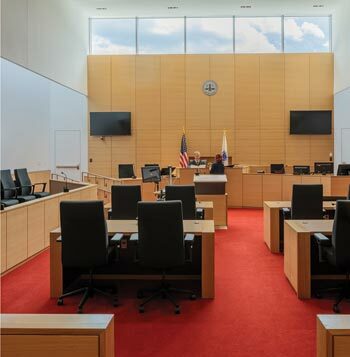 Whereas most courtroom spaces around the country are devoid of much natural light, skylights naturally illuminate these spaces. “Courts are big rooms, and they’re surrounded by program: prisoners on one side, the public on one side, judges on another side — it’s hard to get light into all those rooms,” the architect adds. “I’ve been in countless courthouses with no natural light. But we created a corridor where you borrow light across, so there’s a shelf of light from a corridor next to it. 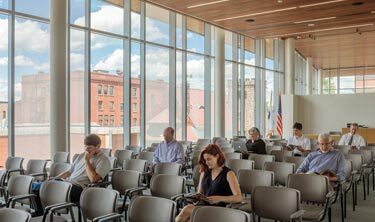 Every courtroom gets natural light.” A large roof canopy also extends over both the lobby and glass facade in order to minimize glare. That’s also assisted by a fritted coating covering a portion of the glass to make it translucent but not completely transparent. To tie in with the original building, the addition begins with a masonry base before giving way to three stories of glass. 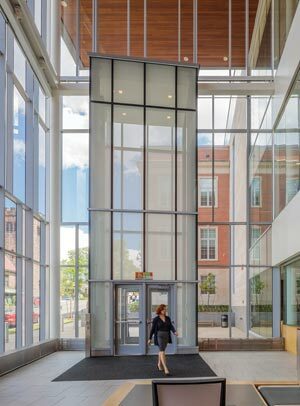 The transparency of the entry facade and lobby helps create a feeling of openness that is particularly needed in a courthouse. Civil – Green International Affiliates, Inc. Contractor – Whiting-Turner Construction Co. Historic Preservation – Preservation Technology Associates, Inc.
Landscape – Richard Burck Associates, Inc. 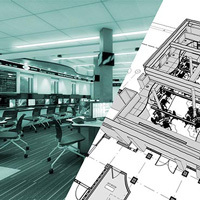 Structural – RSE Associates, Inc.
Brian Libby is a Portland, Oregon-based architecture journalist who has contributed to The New York Times, The Wall Street Journal and Architectural Digest. He can be reached at brianlibby@outlook.com. It is that time of year when we reflect on the past 12 months and think about what we’ve accomplished – or not – and then wonder what the next 12 months will bring. For many of us in the publishing world, December is when we take stock of our work, which in the case of Masonry Design means looking back at the projects we profiled this year. Completed in 2012, the Vernon S. Broyles Jr. Leadership Center in Decatur, Ga., is a serendipitous alignment of program, a compatible historic structure and creativity, have resulted in an environmentally sensitive building that is transforming the teaching and learning experience – along with the entire campus – at Columbia Theological Seminary.